This is for the Pu-erh Connoisseur who may be difficult to please and is finicky about the tea he/she is drinking. The gift pack includes a 2005 Golden Unicorn Raw Pu-erh from a famous tea producing region, Yiwu Mountian. This dark orange brew possesses all the classic characteristics of a genuine Yiwu tea. Its round, thick and smooth body comes with a sweet honey note. It will meet the high expectations of the connoisseur's discerning palate. Pu-erh is best brewed in a traditional porcelain gaiwan (a lidded bowl). 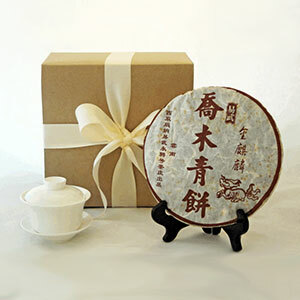 Enjoy brewing your favorite Pu-erh in this exquisite fine white bone China gaiwan that is included in the gift pack.